This is another from the archives…. Tubeworms or interesting creatures. They live deep in the ocean near volcanic vents where the temperature often exceeds 200 degrees. They have no mouth or stomach, instead they acquire all their nutrients from colonies of symbiotic chemosynthetic bacteria. As I mentioned in a previous post some sea worms feed on whale bones. BBC News is reporting some have been discovered off the coast of Sweden (they were previously known only off the coast of California). above is a picture of the Swedish species. 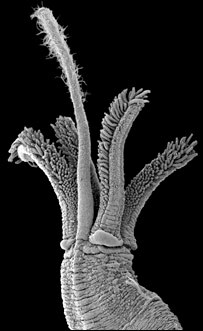 Below is a scanning electron micrograph of the sea worm. Osedax worms are about 1-2cm in length. They root themselves to the whale bones which they then plunder for oils with the help of symbiotic bacteria. 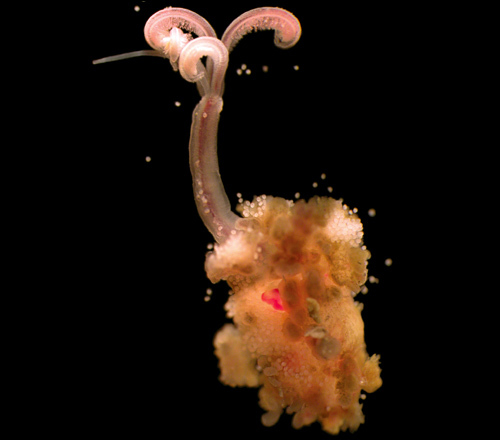 The worms’ flower-like plumes pull oxygen from the water. Their reproductive system is extraordinary – certainly in the case of the Pacific Osedax. “The female Pacific worms keep males inside their tube as a sort of little harem that fertilises eggs as they are released into the water column,” explained Dr Glover. Scientists have established that all of the Osedax species so far identified appear to be closely related to vestimentiferan tubeworms, which are found only at the volcanic cracks in the ocean floor called hydrothermal vents. What concerns researchers is that the commercial hunting which so devastated whaling populations would also have severely curtailed this activity by reducing the incidence of whale fall. It may even have led to the extinction of some bottom-dwelling organisms that depended on this rare but concentrated nutrient supply. 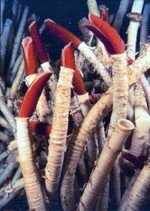 The red at the top of the tubeworm is due to hemogloblin. 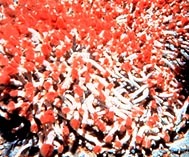 One of the other unique aspects of the tubeworm environment is the extremely large amount of sulfides. 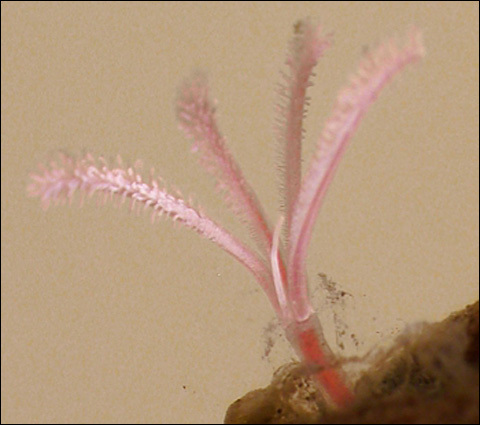 Sulfides present two problems to tubeworms. First, free sulfide reacts with oxygen. Second, they have to provide sulfides to the symbiotic bacteria that provide the tubeworms nutrients. Recent medical studies have focused on the worm’s large hexagonal hemoglobins as possible substitutes for oxygen carriers in human blood. “The newly characterized molecule is substantially smaller than the hexagonal hemoglobin, reducing problems of removal by kidney filtration, but still has six times as many active oxygen-carrying sites as human hemoglobin,” Flores adds. 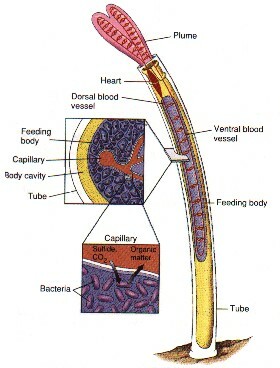 we are led to a possible substitute for oxygen carriers in human blood – which could have many medical applications! Who says evolutionary theory doesn’t have implications for medical research? Science Daily , PBS , Exploring the Deep Frontier , Dr C’s Remarkable Ocean World and Here for more info.